Some of the most poignant literature and rich narrative take place in novels written for the young. I have picked five books that are superbly written with creative plots. There are many books that will never get the full credit or voice they deserve. Some of these titles you may have read, some you may have never heard of. Please give each a chance; they are wonderfully written and quality literature for young and old alike. This is the debut novel by a local Seattle area author. 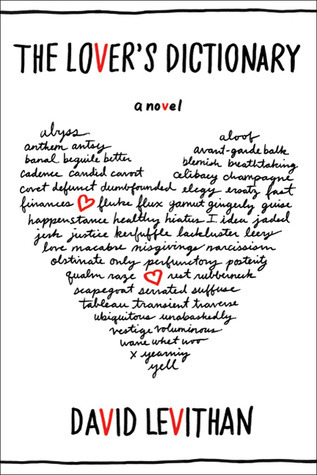 There were many things I appreciated about this young adult novel. It takes place in Seattle, so she had me at chapter one. It incorporates the history of the Seattle area, so she had me hooked. Four Rubbings tells the story of four childhood friends and their relationship with a local cemetery. The grounds keeper for the cemetery and the lives of these four friends collide one Halloween night. Josie, the main character is wrestling in adolescence, having lost her mother. Grace, the care-taker has separated herself from life and lives among the stones of Lakeview Cemetery. 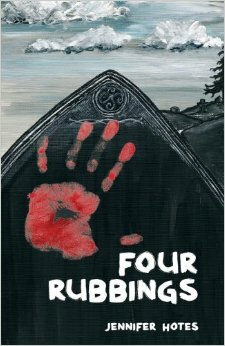 Josie and her four friends enter the cemetery on Halloween and encounter the super-natural. Four Rubbings made me think about healing, and feel moved by Josie and her longing for answers and peace. This book is perfect for a rainy fall; and a good pick for a lover of mystical books with a backdrop of spook. What I loved about this book is that it is the story of four life-long friends, there is no tacky romance, no zombie love, but just authentic friendship told well with a little fright. Four Rubbings makes you want to walk through the head stones and ponder life, death, and everything in between. The next book in the series comes out this spring. A fly that wants to make honey, how sweet of a premise is that? It is a wonderful premise that makes a more wonderful story. Little Herbert is a fly that lives in the dump with his filthy family. He does not like garbage and does not fit in with his slop loving siblings. Herbert literally carves out a nice life for himself in the center of an old peach pit. This is his sanctuary and place of refuge where he studies the art of honey making and perfects his recipe. Herbert goes on a great journey in search of his dreams and a new life. He meets many funny characters along the way and battles many enemies trying to find the Queen Bee. This is a lovely little tale that will make you feel good, believe in your dreams, and cheer for those that follow where their heart leads. It is a great grown up read, but also meant for children. If I had a child or a classroom of children age 5-8 I would read this out loud with them. It is also a safe choice for your 2nd– 5th grader to read (depending on their reading level). Children will find it fun, it is clean, and a fine tale. You can only find this self-published book on amazon, please click here to order it. Madeline is a motivated whip smart young girl with earth loving hippy parents in a community of home-schoolers. She wants desperately to go to school, so she takes the ferry every day from her home on Vancouver Island to the public school. Madeline is seeking out her dreams one day at a time until her parents go missing. Luckily, she meets a pair of bunnies who have purchased new fedoras in hopes of becoming detectives. Together they set out on a journey to find her parents and solve the islands latest mystery. 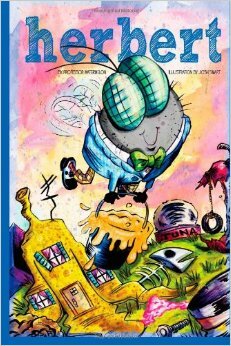 This book is so full of delightful oddities and quirky banter; you will adore the story and eccentric characters. 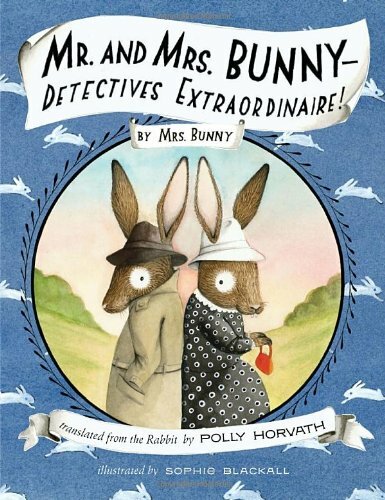 Mr. and Mrs. Bunny display the quintessential long term relationship, children will laugh, but adults will truly find the humor in their daily problems and discussions. Sophie Blackall did all the illustrations; they are beautifully detailed and add to the story. I loved everything about this funny little story. It is fantastic to read aloud but adults will love it as well. I have a deep adoration of the Pacific Northwest. My soul grows green and mossy and takes comfort in the drippy days of our winter rain. Wildwood is set in Portland in the large wooded park outside of the city. Prue, a young girl takes her baby brother on a walk one day and he is snatched by a murder of ruthless crows. Prue must go into the wood to save her brother. The magical land of Wildwood inhabits a witch, talking animals and battles of good and evil. You will weep with Prue as she carries the burden of not being able to protect her baby brother. Even adults need to get lost in worlds of magic, and this is the perfect novel to escape in through the winter. The language of this book is melodic and written in superb prose. Colin is a master story-teller and the illustrations, drawn by his wife are breath-taking. Both are remarkably talented and Wildwood is a fantastic book. 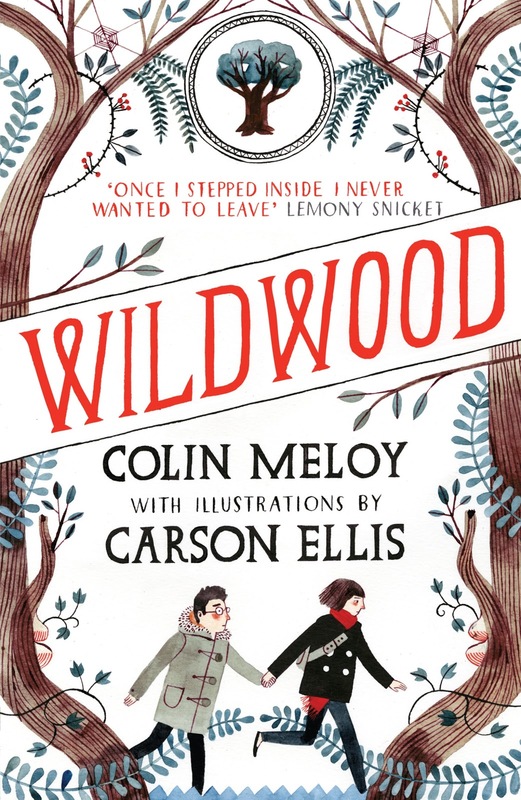 After reading Wildwood I saw Colin Meloy and his wife do a book talk about creating the book. She knitted while he talked, they bantered and out-witted each other as they told stories of their childhoods that led them to the writing of Wildwood. They each showed photos of writing or drawing they had done as kids. The focus of their talk was on how the work of children leads to the work you do as an adult. Their talk has stuck with me, and this book has as well. Odd children attend the Odd Fellows Orphanage, but the joy of this book is the life they get to lead because of the kind hearted headmaster who started the orphanage. A boy with an onion head, a tattooed girl, and other children with oddities get to live and make friends at the most unique place for children you will ever find. They attend school with classes on fairy tales and take field trips to view sea monsters. They have magnificent holiday parties and creatively solve problems of how to make home-made gifts for your best friend bunk mate without them knowing. 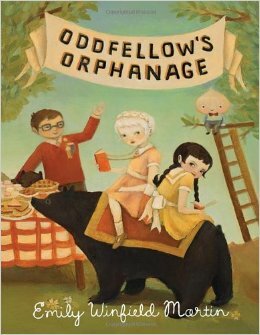 The Odd Fellows Orphanage is so full of whimsy and delight, my only sadness in reading it was when it came to an end. Finding this book felt Serendipitous for me. 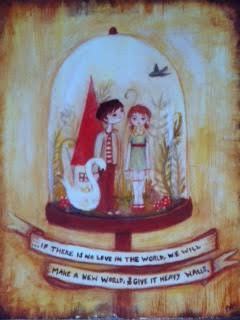 I had ordered a print from Etsy years ago of two children in a quaint glass dome. This summer I stumbled upon a beginning chapter book with familiar illustrations. It was the very same artist Emily Winfield Martin. She turned her small illustrations and vignettes of imagined orphaned lives and made them into a unique novel for children. Molly Wizenberg also deserves her own post, she is a local Seattle Restaurant owner, blogger, writer, and mother. I highly reccomend reading both of her books, good fall reading, great for food lovers, seattle lovers, paris lovers, or anyone with a heart, soul, or palette. My sweet friend Kim recently called this blog, my shop around the corner. I consider that a high compliment, not only because it was Meg Ryan at her peak, but because it represents pursuing the stirrings of your soul. Molly Wiezenberg’s books are her shop around the corner. 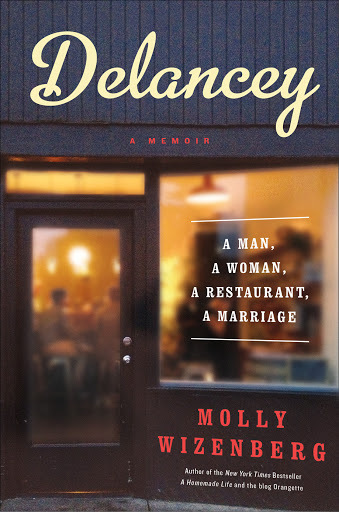 The restaurant Delancy is the shop around the corner their marriage built. I have loved reading her journey of life through food, love, book writing, and restaurant building. She captures the essence of following your dreams through the exciting and weary times. She is honest, but never whiny, humorous, but never snarky. I read Delancy in one day. This avid reader has never finished a non-fiction book in that time frame. These books are delicious slices of life. To finish this book I sat down on a Sunday night with a glass of wine, a plate lined with small rectangles of unusual cheese, and a hunk of bread ripped in half; half to eat with the cheese, half smeared with butter, a dessert of sorts. A Homemade Life is rich and delightful. The book reads like a story, but set in a land of delicious eats. 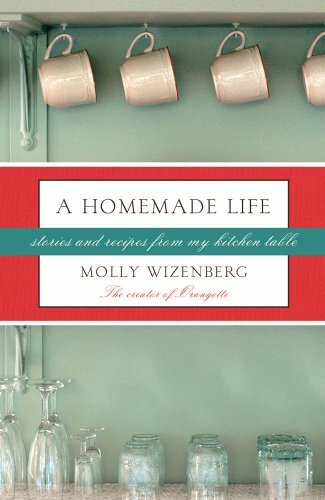 Molly tells the story of her life one recipe at a time. It never lags, it never feel forced or contrived. Her love story flows out of her shared love of food with her sweet and charming husband. You will want to eat, cook, drink, love, and live boldly after you read this book. I never buy books, I am a strict library patron, but I need this book on my shelf. I am bringing her Apples Tarte Tatin to our book club this week. I am thankful she suggests using pastry dough from Trader Joe’s, and I am anxious to try her fennel salad and Ratatouille. When the author met her husband her friend cheered her on saying, “Don’t stop now. This is the bread and butter! This is what it is all about.” I smiled as I finished the book and finished my bread and butter in my cozy home on a Sunday night. This book is bread and butter. Savor it to the end. Getting to experience Delancy was a practice in patience. I saw this book on the Seattle Public Library website and requested it. I was number 184 in line. I waited from April to October to get my copy. Then a friend asked me if I wanted to go to dinner at Delancy, she had heard it was good. It is a small pizza place in a tucked away Seattle Neighborhood. We tried to go on a Saturday night, an hour wait. We went to a neighborhood pub. We went back on a Saturday night, prepared for a wait, and we waited 45 minutes. The pizza was worth it, totally and completely worth it. I wanted a group of my great girlfriend’s to come and experience the pizza with me, we set a date. I got there an hour early, put our name in, and then read in my car by flashlight for an hour. We waited another hour for the diners before us to finish their pizza and chit-chat over coffee. The wonderful hostess that handles the front playfully suggested we stare them down a bit. I did. They sipped their coffee. Delancy, the book and the restaurant, were worth the wait. I was enchanted by the story of their unrelenting determination to open their own little pizza place. Many books I have read lately are about the pursuit of deep rooted dreams. Delancy is the story of the dream to bring impeccably delectable wood fired pizza to Seattle. I truly respect the people of Seattle with vision that make old things new and restore instead of destruct. Molly and her husband do exactly that. I felt a kinship with this book, at first I thought it is because I am Seattle resident; the story takes place in a ten mile radius from my home. However, it is the story, not the setting that draws you in as a reader. Regardless of where you live, the story is poignant, and reads like a novel. It leaves you with a feeling of contentment and inspiration to pursue your relentless desires. You will cheer for Molly and her husband. Go to Delancy, you will dream of the White Pie long after it is finished. If your quirky best friend wrote down all her thoughts on life and gave them to you alphabetized with diagrams and illustrations, it would turn out like this book. It was such a sweet and pleasant read, not to deep, not too serious, just an enjoyable weekend read. The author introduces the book by telling in the third person how her book came to be. She was always out of the box, writing short bits and pieces of thought, but could never find a place for them in the publishing world. Finally, she found her niche, and it is her Encyclopedia. The alphabetical entries are in the format of a subject followed by an explanation. 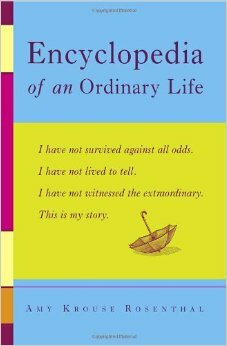 Her life story unfolds to you in random thoughts that work together and make sense. The ‘B’ section starts: Bad Movie, Bagpipers, Birthday, Birthmark. Who can resist reading thoughts on Birthmarks and Bagpipers? A great one-sit-wonder. If you are on the hunt for a book that is: told from the view of a hen, translated from Japanese, is short but poignant, and can be read in a day, this is your book. 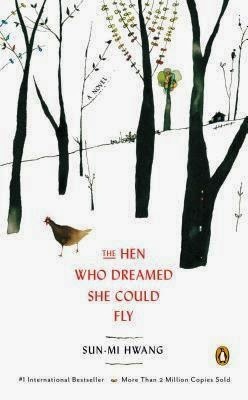 The Hen Who Dreamed She Could Fly is an unusual gem. The story is told from the perspective of a hen who wants to hatch an egg, and her quest to battle the weasel who wants her as dinner. Her journey is sweet and touching. I have read a few books that have been translated from other languages and I really enjoy them. When a book is translated it automatically has a different voice and feel than a book written in English first. It is a characteristic that is hard to describe, however it makes the book all the more enjoyable. The length of this book makes you feel like the Queen of the Castle, you can read it in a day and feel so accomplished. I love a good classic tomb of a book that takes dedication and fervor, but there is something nice about a short little read. If I could compare this book to chocolate, it would be a box of fine, handmade delicacies. It is small, but exquisite. I spent one afternoon idling in the road of life and enjoying ‘The Lover’s Dictionary. It is a perfect procrastination book, if you fail to get something important accomplished, at least you can accomplish reading an entire book. Now, people like books for different reasons, many are very personal and deeply rooted in convictions, emotions, experiences, etc. The reason I liked this book is because it was so creative, bold, and short. Levithan tells the story of his relationship in alphabetical order with selected words from the dictionary, and he does it well. I did not love some of the events, but I loved the format and the voice of the writing. I loved learning new words and expanding my vocabulary. A good one-sit-wonder.